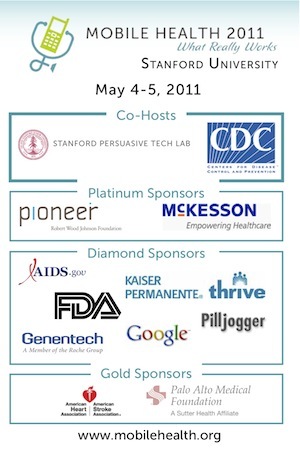 We are working hard each day to make sure Mobile Health 2011 is one of the best events you’ve ever attended. Our Content Team is carefully selecting the themes and speakers for the conference. Our two-day event will feature what really works to improve the health behavior of everyday people. For two action-packed days, you’ll hear from the winners, and you’ll learn from their successes. But that’s not all. This year we show you what really works in many facets of mobile health, from prototyping to testing, from distribution to monetization. Check in will begin at 7:45 AM. Each session featured three or four experts giving short talks, followed by a panel discussion on the topic. The panel included Q&A with the audience. Breakfast, lunch, and two breaks will be provided each day. There is also a beer and wine reception with hors d’oeuvres on Wednesday (May 4) evening directly after the closing program for the day. We’re planning our meals to be healthy and mostly vegetarian. If you have any specific dietary requirements please get in touch with Tanna Drapkin.